Happy New Year!! and I hope everyone had a magical Christmas. I know I did. Well the holidays are over, my hubby is back to work and visitors have all gone. I was very excited to have spent a day in my workshop (“Lady Land”) to run my hands through my yarns and fleeces. So many colours jumped out at me. I wanted to spin them all at once. Just as well colour is in this winter. Lots and lots of colour and of course our trusty black. So I spun up a Fruit Salad of colours. Here’s a sneak peek. 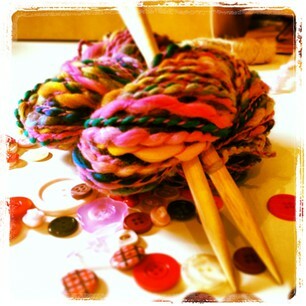 Its not on my shop yet, but keep an eye on this space and I will let you all know when there are new products and yummy hand spun yarn to make your 2013 goodies.